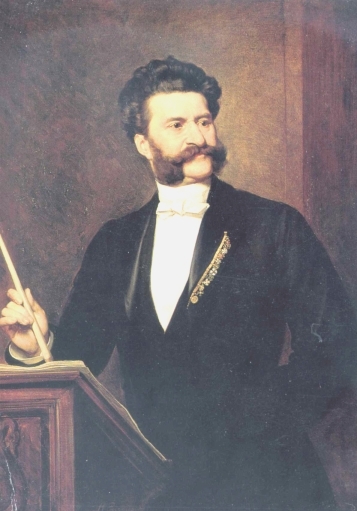 Johann Strauss the Younger, the most famous and enduringly successful of nineteenth-century light-music composers, was born in Vienna on 25 October 1825. His father, Johann Strauss the Elder, was by that time well on his way of becoming Europe's uncrowned king of dance music. Indeed, it was only with Strauss senior's untimely death in 1849 that the younger man could advance his own musical standing in his native Vienna. Building upon the firm musical foundations laid by his father (1804-49) and Joseph Lanner (1801-43), Johann II, along with his brothers Josef and Eduard, developed the classical Viennese Waltz to the point where it became as much a feature of the concert hall as the dance floor. With his abundantly tuneful waltzes, polkas, quadrilles and marches, Johann II captivated not only Vienna but also the whole of Europe and America for more than half a century. The thrice-married 'Waltz King' was persuaded to compose operetta, not by Offenbach, as often stated, but by his first wife, the singer Jetty Treffz. Strauss completed sixteen stage works, of which Die Fledermaus (The Bat, 1874) and Der Zigeunerbaron (The Gypsy Baron, 1885) remain the most popular and more than five hundred orchestral compositions - including the most famous of all waltzes, An der schönen blauen Donau (The Blue Danube, 1867). Johann Strauss II died in Vienna on 3 June 1899.